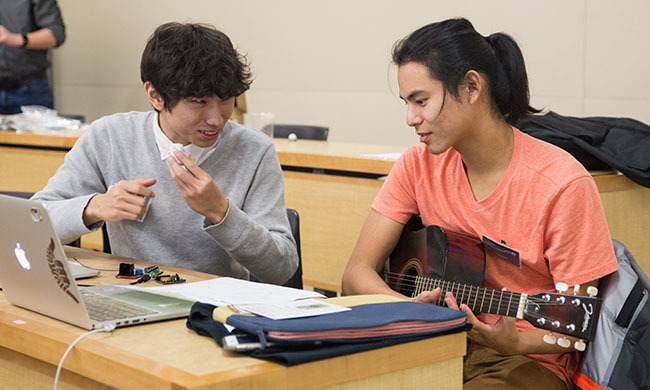 Kedi Yan (electrical & computer engineering) and Nick Wong (computer science) work on their self-playing guitar. 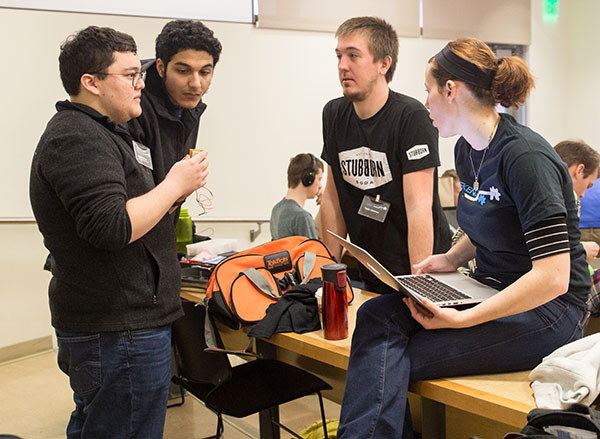 More photos in the OSU EECS Flickr album. “Gadgets and Gizmos” was the theme for the first HWeekend of 2017 on January 20-22, jointly sponsored by the College of Business and the College of Engineering. 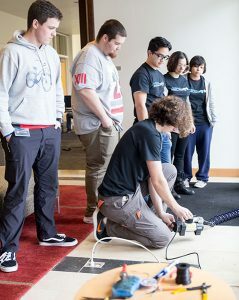 In just one weekend, forty-seven students from business and engineering designed, built, and pitched their idea for a marketable product including temperature based alarm clock, a computer controlled potato launcher, a 3-D printed longboard fender, and a self-playing guitar. It was the seventh iteration of the popular event that provides students from different disciplines an opportunity to work together in teams. Students came from a variety majors including business, bioengineering, civil engineering, chemical engineering, computer science, electrical and computer engineering, environmental engineering, and mechanical engineering. The potato launch team tests out their device. More photos in the OSU EECS Flickr album. This event allowed students to make use of the new Buxton Hall Makerspace and Mastery Challenge lounge, which gave students access to 3-D printing, soldering irons, a drill press, laser cutting, and UV ink logo printing. Mentors for this HWeekend included six industry members from Intel and two from Microsemi. Staff from both the College of Business and the College of Engineering also helped mentor students through the creation and marketing of their projects. At the end of the weekend, the students received group awards for their dedication and hard work. The Executors award goes to the team that produces the best engineering execution of their idea to create the most polished final product, the Helping Hand is for the team that contributes the most to other teams, and the InnovationX Pitch awards go to two teams who had the best business pitches for selling their prototypes. The temperature-based alarm clock team works out their design. Executor: Temperature Based Alarm Clock team. The team included members Noah Hoffman, Taylor Johnston, Alexia Patterson, and Abdurrahman Elmaghbub. InnovationX Pitch: Checkpoint team and Temperature Based Alarm Clock team. Professor Burnett wins another award! Professor Margaret Burnett has been on a roll lately, to put it mildly. Her most recent award is the 2017 Undergraduate Research Faculty Mentoring Award announced this month by the Education Committee of the Computing Research Association. This follows a string of awards from national organizations including the CHI Academy, the National Center for Women and Technology, ACM SIGSOFT, and IEEE Symposium on Visual Languages and Human-Centric Computing. She was also named 2016 Distinguished Professor recipient by Oregon State University, the highest academic honor the university can bestow on a faculty member. 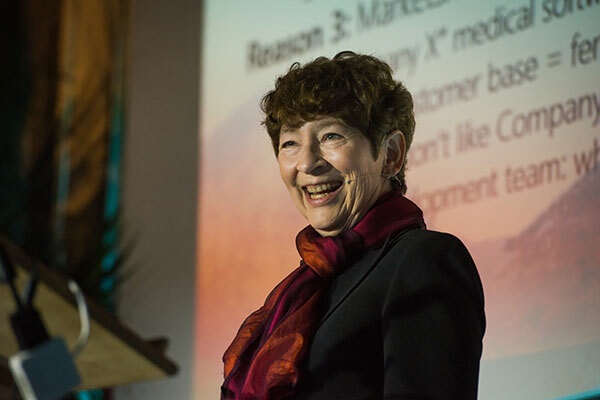 Margaret Burnett, Ph.D., is a distinguished professor in the School of Electrical and Computer Engineering at Oregon State University (OSU), a member of the ACM CHI Academy, and an ACM Distinguished Scientist. Burnett has contributed pioneering research on how ordinary users interact with software and optimizing that interaction. This resulted, in part, in the development of a new subarea, which is at the intersection of human-computer interaction and software engineering, called end-user software engineering. Throughout her academic career, Burnett has continuously worked with undergraduate researchers and even accommodated high school students in her lab. She has mentored 39 undergraduate students in research; 21 were from underrepresented groups in computing, 32 co-authored published research papers, and 25 went on to graduate studies. A selection of the honors of her highly accomplished mentees includes three Google Scholarships, three NSF Graduate Fellowships, and two National Physical Sciences Consortium Graduate Fellowships. In her nomination, several mentees attested to her personal influence on and involvement in their lives and careers. Impressively, Burnett influenced the culture of faculty undergraduate research mentoring in her school, increasing it to 50% participation. She has also led efforts to better support a diverse undergraduate population through trips to the Grace Hopper Celebration of Women in Computing, the adoption of a diversity plan, and new experimental scholarships for incoming freshmen women in computing. She has received awards from NCWIT, Microsoft, and OSU for her mentoring and research.